Your master suite should be your oasis, your place where you go to relax and unwind - and your bathroom should be a big part of that. 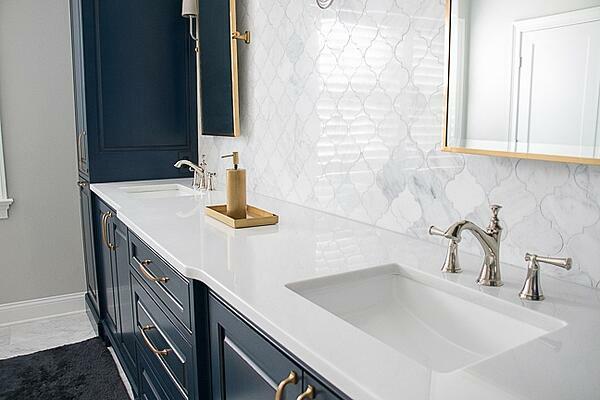 Whether you have space for a huge master bathroom remodel, or you are looking to make your current space a little more luxurious, we have some bathroom makeover ideas that are sure to make your ensuite a little sweeter. Two sinks are better than one! 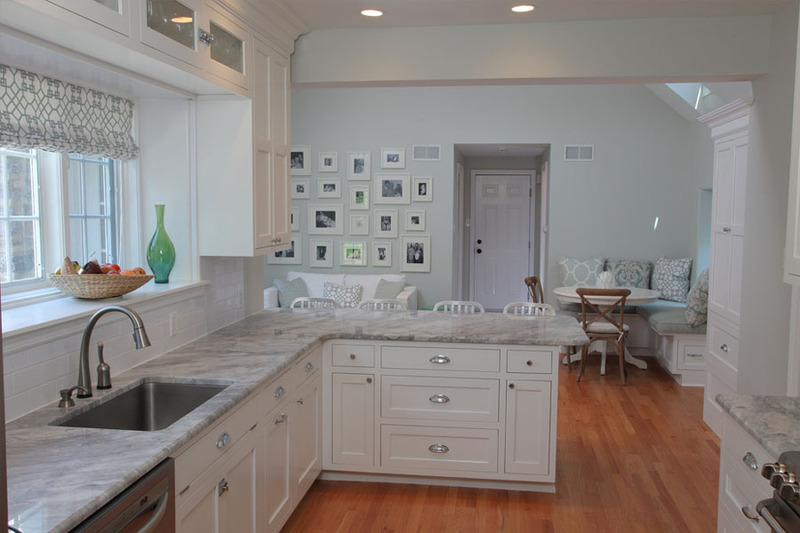 In the Collins project, the his-and-hers sinks were a must-have for the homeowners. Having your own space when you're getting ready can make all the difference in your daily routines. This double vanity not only provides separate counter space for the couple, it also divides the storage so all of your products and toiletries can stay organized. When planning your bathroom makeover, consider two sinks, two mirrors and two of anything else you'd rather not share. 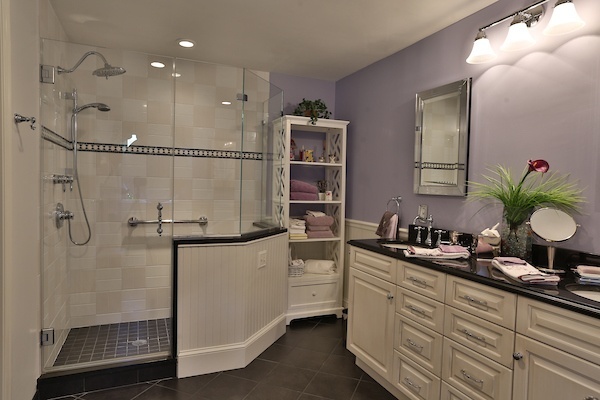 Get more bathroom ideas from the Collins project here! The Douglas project took notes from the double vanity in the Collins project with the idea that two shower heads are better than one. You already have the plumbing run for one shower head so adding another is typically a matter of picking out the fixtures if you are doing a bathroom remodel. 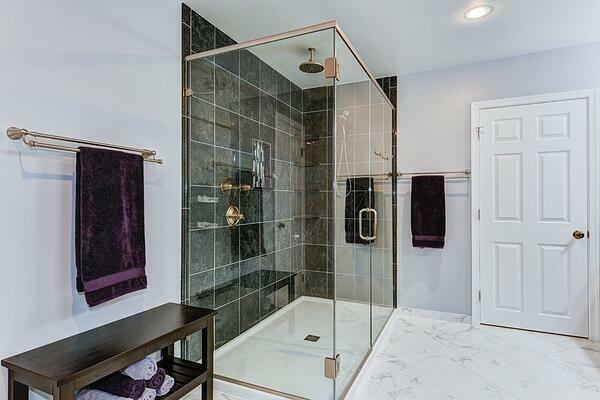 If you want a bigger shower, double shower heads are a must for creating a luxurious, spa-like experience. Plus, the added water power can help keep a bigger, tiled shower warm. No goosebumps here! Ask your contractor about water saving shower heads if you go this route - you'll thank them later when you get your water bill. 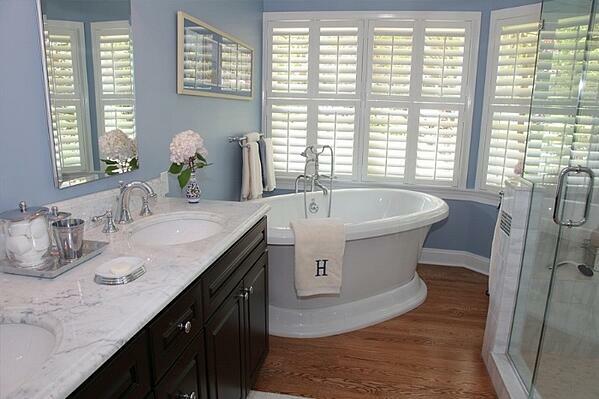 Get more bathroom ideas from the Douglas project here! We are in love with this bathtub form the Hidden Pond project. Size and placement are everything when you select your tub. Nothing gives that luxurious, spa-like feel like a tub with a view. If you love a long, relaxing soak maybe with a book or a movie, consider a ledge or counter space around your tub as well. Looking for a more private place to unwind? 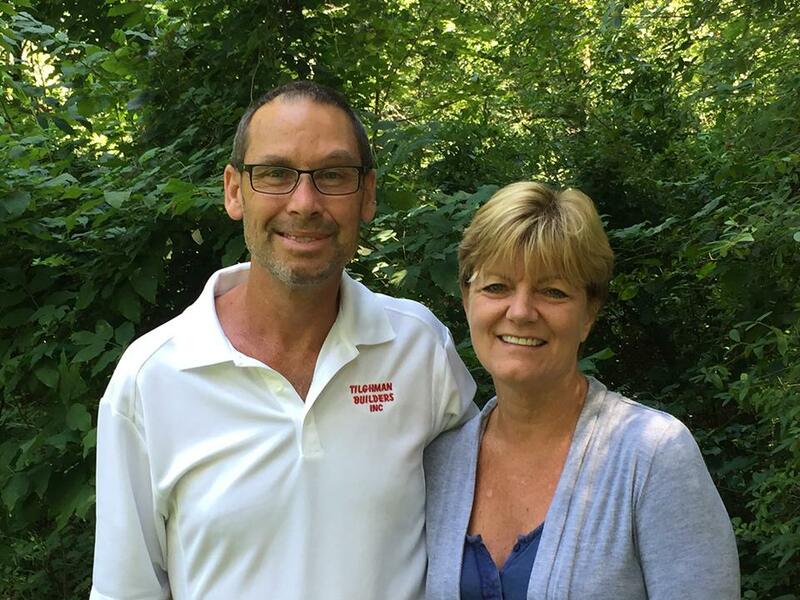 The bathroom makeover from the Oreland Mill project may be just what you're looking for. These light curtains create a private oasis feel in an otherwise totally open bathroom. The homeowners can close off from the outside world and truly relax in their cool, calm bathroom. 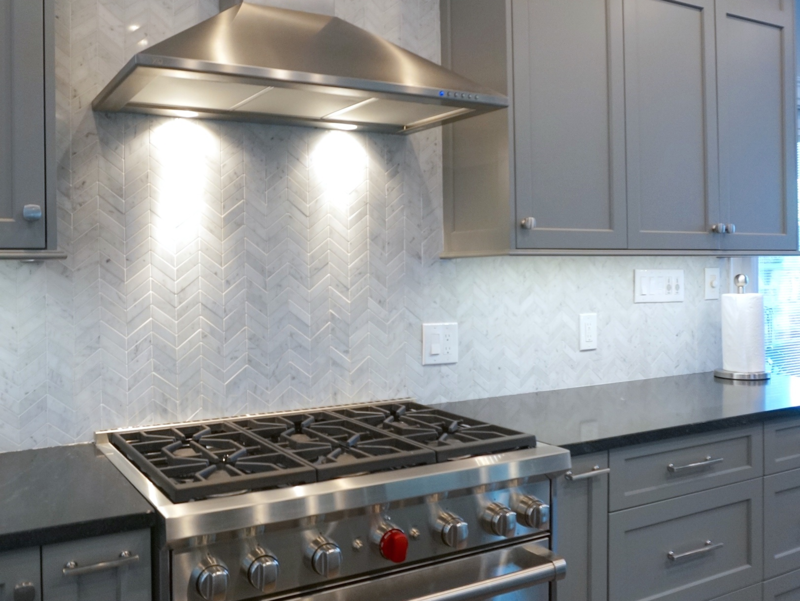 With this much space, we had a lot of fun designing the bathroom floor plan for the homeowners at the Petty Lane project. They opted for a whole wall of storage down the length of their wide hallway-style bathroom. As you can tell, everything here has its place so their bathroom always feels clean and tidy. Keeping your bathroom neat isn't always a priority for busy families since you can typically close the door and ignore it. But how much easier is it to relax and enjoy your space when you don't feel like you need to be doing chores?! 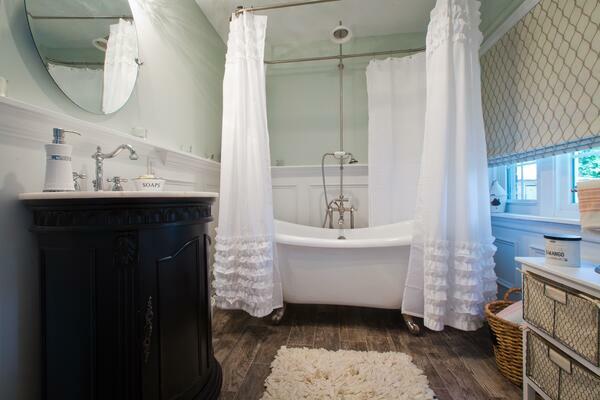 Get more bathroom ideas from the Petty Lane project here! Rain shower heads, like the one here also from the Petty Lane project, are much wider than typical shower heads and aren't fastened to the wall, but to the ceiling so the water falls vertically - like rain. These shower heads are an amazing addition to any luxury master bathroom makeover. The calming sensation of water falling over you will have you singing in the shower, even on your most stressful days. 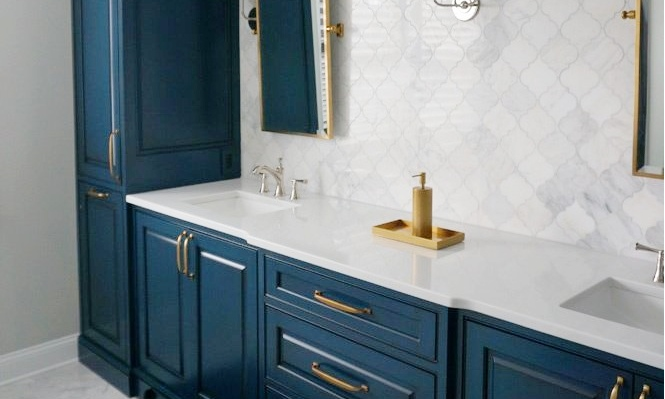 Want more ideas for your bathroom makeover? Check out our full bathroom portfolio here. 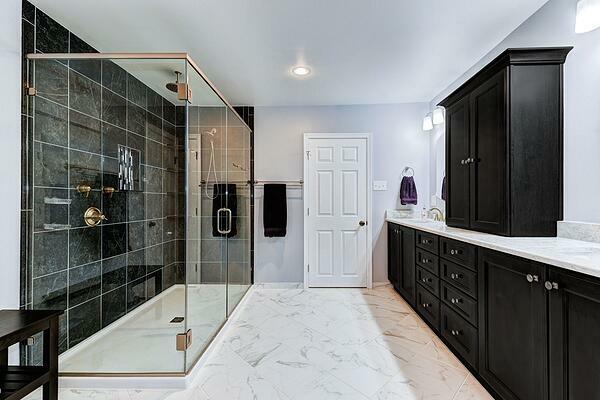 How Much Does a Pennsylvania Bathroom Remodel Cost?